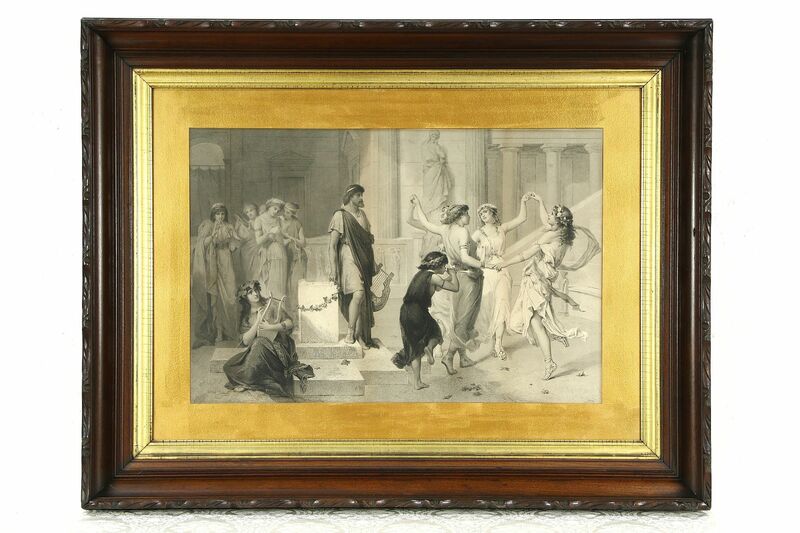 A classical Roman scene of dancing girls and a lyre player has an original hand carved frame, and dates from the 1850's. This Victorian period engraving is signed "NY," but the original label behind the mat was cut out and is lost. There is a shadow line at the right edge plus a little water damage, see photos, and the original mat has been regilded. The solid walnut sculpted frame still has its original finish in very good condition, the gold liner and wavy glass are also original on this American made work of art. Overall size is 43 1/2" wide, 34" tall and 3" deep.